The Superhot—aka. 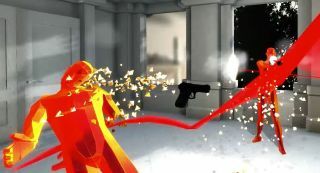 SUPERHOT—alpha has gone out to its relevant backers, and that means videos filled with time-warped polygonal violence are appearing online. Here's one that shows the game's Endless Mode—taking the same 'time only moves when you do' format and applying it to a non-stop horde defence. It's not exactly the most thrilling application of the format. One of the original free game's strengths was its short film-inspired scenarios. I imagine that'll be the same for this expanded release. Nonetheless, the footage shows some of the new weapons in action—plus you get to see a man killed by beakers.